Last night before turning in, I stepped onto the back deck and looked to the east. I had to move around to get an unobscured view through the trees, but I saw the super blue moon. It was incredible. I snapped a picture with my phone, but it paled in comparison to the photographs Jordan is getting with the telescope we bought him. It has an attachment that lets him take pictures. This morning, we rose at 6 a.m. and I punched the brew button on my coffee maker. Stepping out again onto the back deck, I could see the lunar eclipse in progress. Jilda usually waits until the coffee is ready before rolling out of bed but she made an exception this morning. We stood shivering as we watched the earth shadow munching away at the moon. We'd step back inside and then step back out every few minutes to check its progress. the last thing we saw before it slipped below the western horizon was a sliver of moon that looked like a thumbnail clipping. I understand that the folks in California had an opportunity to see the entire show, but we saw enough to say that we saw the first super blue moon eclipse in over 150 years. I wrote about that in my journal. I hope you had a chance to see this moon. It was something rare. I slept thru it. 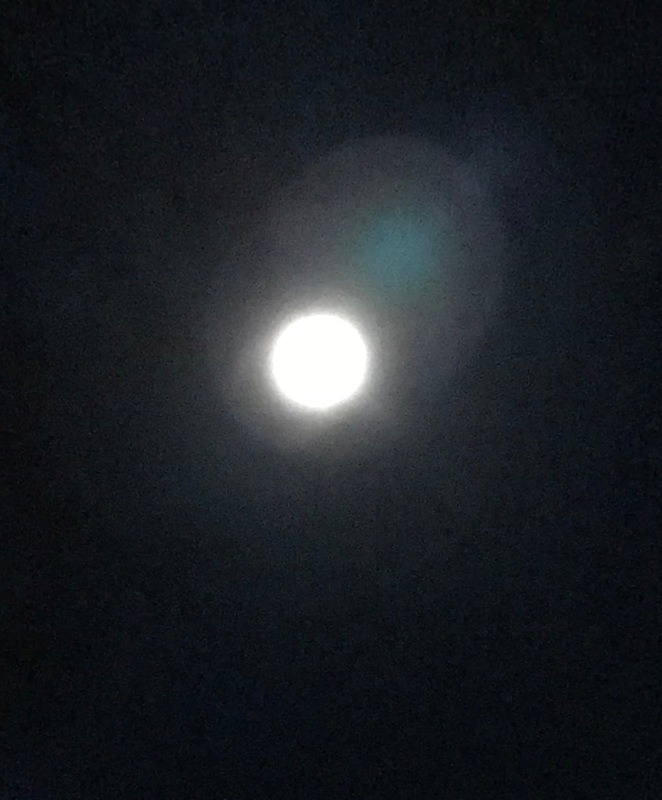 Didn't hear of the eclipse, not sure it was seen in Jersey, the blue moon thing is just the second full moon in one month, pretty much like any full moon...was this closer than most and thus larger? Our sky was hazy as there was snow in the atmosphere early in the morning but the moon looked big. I hope Jordan will fwd the moon photo he took so we can see it. Lucky kid to have a telescope with camera. Thanks for sharing the picture...it was too cloudy for us to see it. I forgot people get up that early, no, don't say it, 'at ain't early!' But it is to me anymore. Clouds got in the way but I did see the full moon before heading to bed and it was as light as day out. I'm glad you and Jilda got "mooned" however! I would not have been able to see it anyway. We had thick clouds that morning. I hate I missed it. I never keep up with the moons until I see it. It is always the big orange moon that gets me.